These animals did not die in vain. No, they’ve been processed with great culinary craftsmanship to become delectable meals for the fortunate patrons of the HK BBQ Master. The food is great despite the obscure location. Located on the west side of No.3 Road in Richmond, in the South east corner of the parking lot under Superstore, its about as visible as a smile on a dim sum restaurant waitress. I would not have found this place if not for the suggestion of a supportive commenter (please keep them coming!). 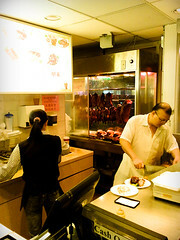 The Master is a small restaurant specializing in Hong Kong style BBQ meats, with seating for just over a dozen people. I got there around 11:30 and found it empty, but within minutes the tables filled up and a line started to form at the front for both seating and take out. The sound of a butcher knife hitting a chopping block droned on non stop for the whole time I was there while golden brown ducks flew off the hooks into styrofoam containers. Business is good for the Master. Ordering is easy. Pick however many types of BBQ meat you want with your rice. 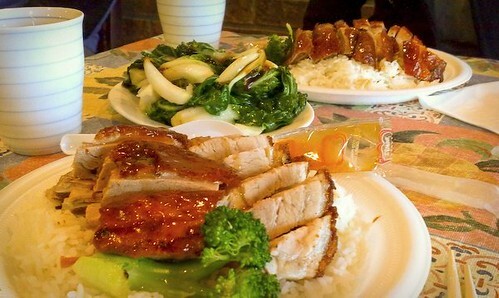 2 being the optimal portion according to the waitress, so I went with the roast duck and crispy skin roast pork. 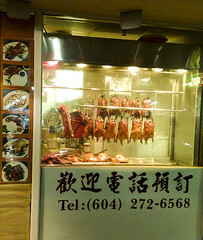 I get roast duck pretty often from Asian supermarkets (the bones make excellent soup stock), and none have compared to the juicy bites from this place, though that might also be cause I rarely eat it fresh off the hook. The crispy skin pork was amazingly good. I never liked this dish as the two times I’ve tried it previously it always tasted too…pork…to me. But this one was tres tender, and simply delicious. 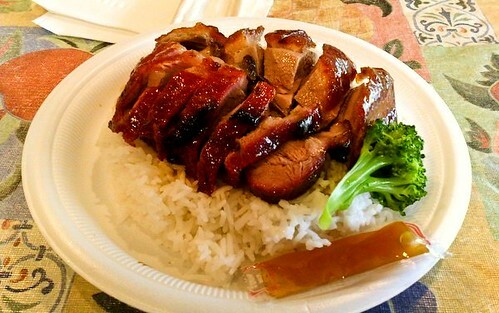 The char siu pork was excellent as well, we opted for the lean version, which was packed with flavor. Likelihood of returning? Actually I already did. Got half a duck to go and ate it for dinner. But yeah, worth multiple encore visits. Happens to be winner of some award for best BBQ shop. Thanks for pointing that out. It was $17 for 2 of their 2 meat meals plus one veggie. Forgot what the menu price was exactly. What an obscure location, your description made me realize I’ve been near a few times but I never would have known! Thanks for the intro! so glad you enjoyed the bbq. this is seriously the best chinese bbq in Vancouver and I’ve got my father addicted to it now. the prices have gone up a bit. it’s now $6.49 for 2 meat choices, and $7.99 for 3. I always get the 3 combo because I know I’ll be sharing. vegetables are $6 a plate. sometimes parking can be challenging because it’s such a busy area. i recently discovered some close parking just outside near the Superstore gas station side.